Gunmen disguised as members of the Pakistani security forces killed at least 22 passengers on Friday night after forcing them off buses travelling from the western city of Quetta to Karachi on the southern coast, officials said. The assault in the province of Baluchistan occurred in the town of Mastung, around 40 kilometers south of Quetta. “Fifteen to 20 armed men in three pickup trucks and wearing security uniforms kidnapped around 35 passengers,” Sarfaraz Bugti, Baluchistan’s home minister, told Reuters. He said the bodies of 22 passengers were later found around two km away from the main Quetta-Karachi highway in foothills. Seven of the assailants have been killed in an operation involving hundreds of soldiers and police, he added. The circumstances of the passengers’ deaths could not immediately be established and the motives of the assailants were unclear. The attack will be a concern for the government of Prime Minister Nawaz Sharif because it raises further questions about the feasibility of a new economic corridor Pakistan wants to build with billions of dollars of Chinese investment. The much-vaunted project, announced when Chinese President Xi Jinping visited Pakistan in April, envisages an eastern and western route, with the latter passing from Gwadar port in the south through Quetta and beyond. Separatists have been waging an insurgency in Baluchistan, of which Quetta is the capital, for more than a decade. They are demanding an end to what they see as the exploitation of their resources by people from other parts of Pakistan. 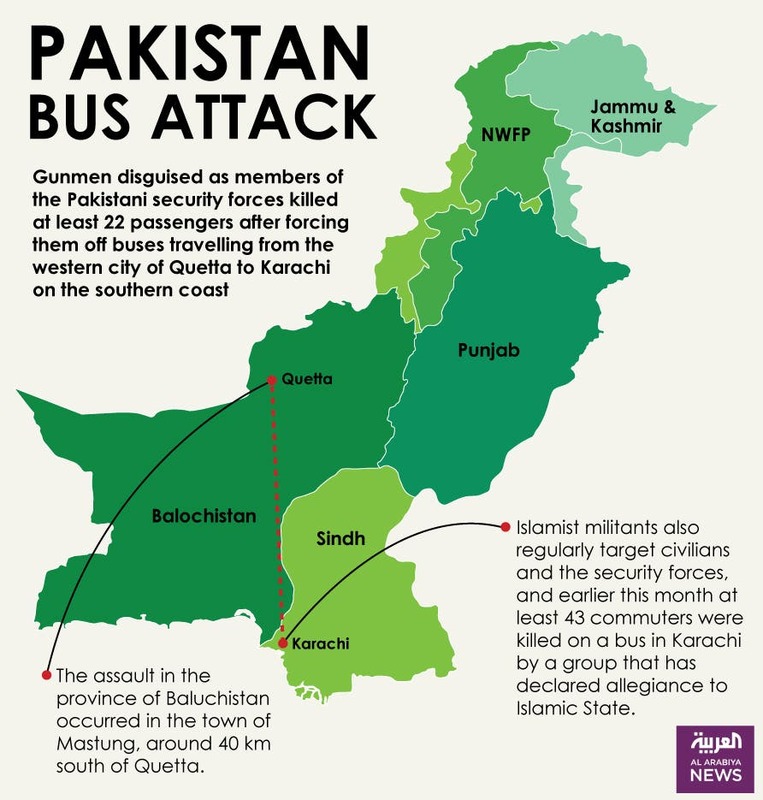 Islamist militants also regularly target civilians and the security forces, and earlier this month at least 43 commuters were killed on a bus in Karachi by a group that has declared allegiance to Islamic State. All of the victims in that attack were Ismailis from Pakistan’s minority Shi’ite community, but one security official said the Mastung attack did not appear to be sectarian. Officials in Mastung said a major operation involving four helicopter gunships and around 500 security personnel on the ground was underway to hunt down the remaining assailants believed to be hiding in mountainous terrain. “The kidnappers and terrorists are surrounded by security forces,” Bugti said. In Quetta, where the bodies of the slain passengers were taken, hundreds of people gathered outside the governor’s house and staged a protest over the lack of security in Baluchistan. Among the demonstrators were relatives of 16 of the victims, whose bodies were laid out in a line wrapped in cloth.